Everything you need to run your Scrip program! 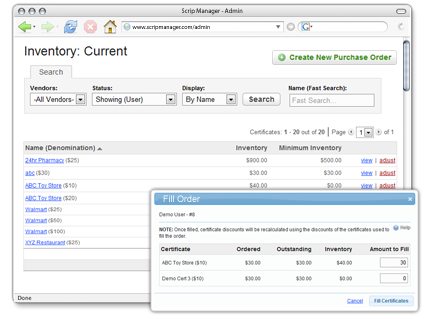 Adaptable – Scrip Manager can handle unlimited suppliers and direct-order certificates. Everywhere – Access Scrip Manager from the cloud and use it at school, home, and work! Scrip Manager automatically tracks all inventory changes. All incoming inventory purchases and outgoing order distributions are reflected real-time and managed with a simple interface. When you need to purchase certificates and inventory from your vendors, Scrip Manager creates purchase orders with one click. Never miss an ordered certificate. Never run low on inventory. Weekly orders from users can be filled easily with one click. The reduction in inventory is immediately reflected in Scrip Manager. Receive a last minute order or don't have the required scrip? You can fill only part of the order as well. The order tracking page allows the administrator to view any order placed. The search box gives you the ability to filter the results and instantly see the desired orders. 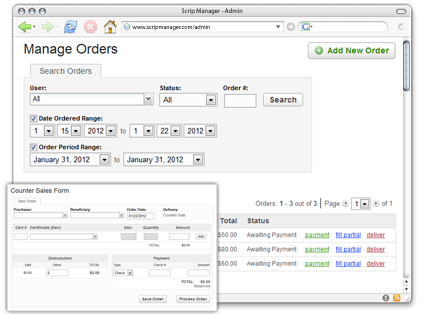 The manage orders page allows any administrator the ability to view order details, process payment, fill order from inventory, and mark order as delivered from one easy to use page. 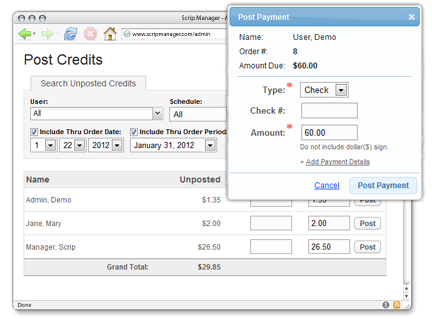 Scrip Manager allows for adaptable order periods (weekly, biweekly, custom). Continuous orders can also be placed at any time. Scrip Manager also has a counter sales form to process orders taken in person. Scrip Manager displays all accounting information to track money. The payments for each order can be recorded and are automatically associated with the corresponding transaction. All credits earned by users are tracked and totaled by Scrip Manager. Efficiently post credits to users and/or their beneficiaries at any time. Managing credits is a difficult and tedious task and is now easy! The powerful accounting section can also track expenses. View the profitability of your program at any time. 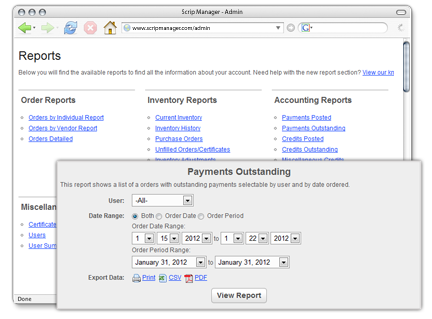 Scrip Manager creates custom reports for every piece of information you enter and track. The reports are easy to create and are adaptable to your needs. With over 18 different types of reports to customize, you can assess any information to analyze the status of your program. The detailed reports are created in a browser window to display on screen. Additionally, all reports are printable in PDF format to be saved, emailed, or printed efficiently. Reports can be exported to any software program for further use. An easy-to-use order form allows users to purchase certificates much like any online shopping cart. Simply add the desired certificates, select the amount, and place the order. Conveniently for users, the program is accessible from home, work, or any internet connection. Pay online with credit/debit cards or ACH. From the simple frontend area, users can view past orders, upcoming order schedule, and track all credits earned and posted. The user area allows you, the administrator, to communicate news, program information and changes, and updated schedules to the users quickly. Users and administrators can also communicate with an integrated message system. 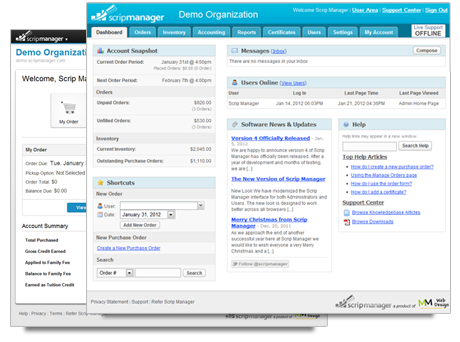 Scrip Manager databases are automatically backed up each night to preserve all data. Scrip Manager allows you to save your data at any time. Your data is unique to your program and we believe it's yours to keep. Tracking orders and inventory from multiple vendors easy. Local stores or large vendors are now easy to interact with and track. 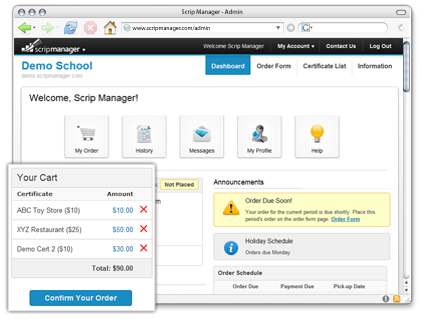 Scrip Manager can email each user to remind them to order each week. Never have a user forget to place an order again. To accommodate each organizations theme, the user area can be modified to match the color and logo or your program. Our staff is here to help you learn and use Scrip Manager. A searchable knowledge base makes it very simple to learn.